Review posted November 21, 2018. TED Books, Simon & Schuster, 2016. 107 pages. 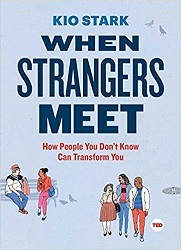 This is a short little book, based on this TED Talk, "Why You Should Talk to Strangers." She didn't actually convince me. I'm an introvert; I'm not going to do her exercises. However, she said things that were fun to think about. Connection is good for us. I was happy I read this before I went to ALA Midwinter Meeting and planned to ask strangers to vote for me to be on the 2019 Newbery committee. Those encounters were all very positive. I do think it helped to think about the dynamics of talking to strangers first. For that matter, my job at the library involves talking with strangers -- and helping them -- every single day. So to think a little more deeply about what's going on when that happens was good. This is a book about talking, and it's also a book about seeing, listening, and being alert to the world. I want to show you how lyrical and profound our most momentary connections can be, to broaden your understanding and deepen your perception of people who are strangers to you. I want you to see the invisible mechanics and meanings of street interactions. I want to give you a new way to be in love with the world. This book is fun reading, and a great option for those who prefer books to video (like me).